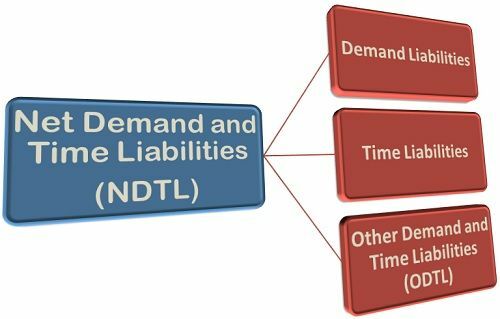 Definition: The Net Demand and Time Liabilities or NDTL shows the difference between the sum of demand and time liabilities (deposits) of a bank (with the public or the other bank) and the deposits in the form of assets held by the other bank. Suppose a bank has deposited 5000 with the other bank and its total demand and time liabilities (including the other bank deposit) is 10,000. Then the net demand and time liabilities will be 5,000 (10,000-5,000). Demand Liabilities: The demand liabilities include all those liabilities of a bank which are payable on demand. Such as current deposits, cash certificates and cumulative/recurring deposits, outstanding telegraphic transfers, Demand drafts, margins against the letter of credit/guarantees, credit balance in cash credit account, etc., all are paid on demand. Time Liabilities: Time liabilities are those liabilities of a bank which are payable otherwise on demand. These include fixed deposits, cash certificates, staff security deposits, time liabilities portion of saving deposits account, margin held against the letter of credit (if not payable on demand), gold deposits, etc. Other Demand and Time Liabilities: These include all those miscellaneous liabilities which are not covered in above two types of liabilities. Such as interest accrued on deposits, unpaid dividend, suspense account balances showing the amount due to other banks or public, participation certificates issued to other banks, cash collaterals, etc. Please explain why banks request their customers to maintain balance on every quarter or half yearly or annually in their accounts. some banks they will term it as CASA target. please explain what is the use of it.